Going to trade shows, everyone wants their booth/exhibit to stand out from the competition. Bright displays, flashing lights, give-aways, contests, games… There are a million different ways companies compete to grab people’s attention. There are so many of these “attention grabbers” because each exhibit only has a finite amount of space and time to interact with attendees and turn them into a potential lead for your business. Incorporating the mezzanine into your booth provides you with nearly double usable space in your limited area. Know you can have an entire area of your booth that can be reserved for having a calm, prolonged conversation with potential clients. Just make sure you have the reps available! And of course, it also opens up more room for marketing materials, product samples, and demonstrations. Perhaps the biggest benefit of having a trade show mezzanine is its ability to make your booth easily seen from across the building! Media displays are a great way of drawing people in to check out your company. However, they have to be able to see it first! Using a mezzanine system instantly makes your displays and marketing materials visible from any spot on the hall. Trade show mezzanines can be easily decked out with your very own custom color scheme to match your company colors and integrates seamlessly with the rest of your marketing pieces, signs, and displays. Essentially, when attendees are walking around and see your upgraded booth, they will know you guys mean business. 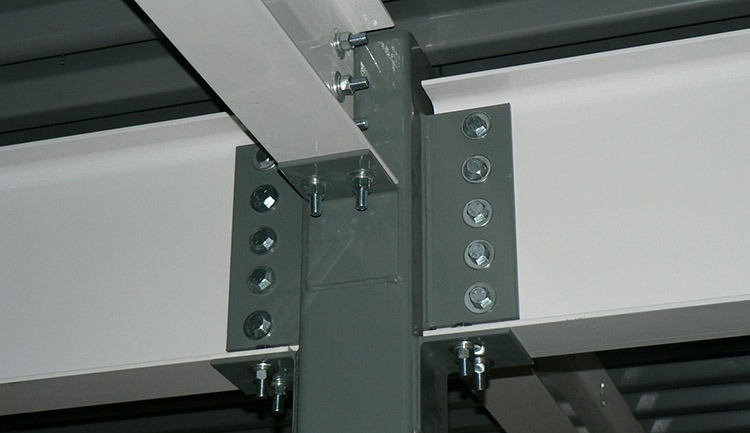 Bolt-together design allows for the mezzanine to be re-assembled in another location. 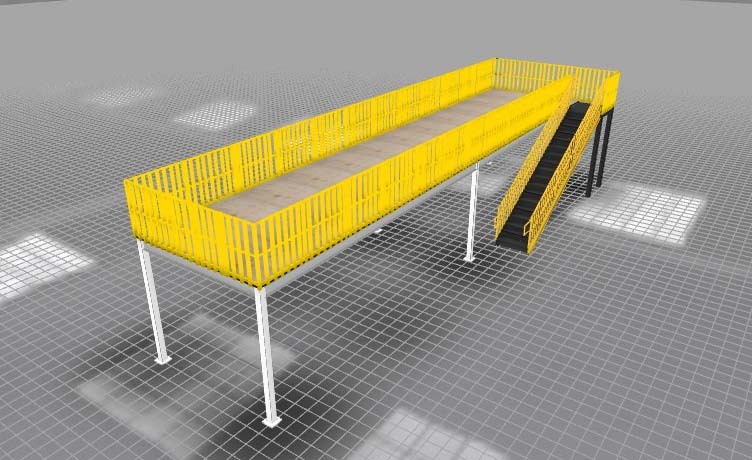 With our bolt-together modular mezzanine design, these structures are fully re-usable and relocatable. When installing our system, the mezzanine can be designed to fully assembled and disassembled. From there, the mezzanine can be stored away at your facility (or even re-assembled to be used for another purpose), until it is needed again for another trade show. 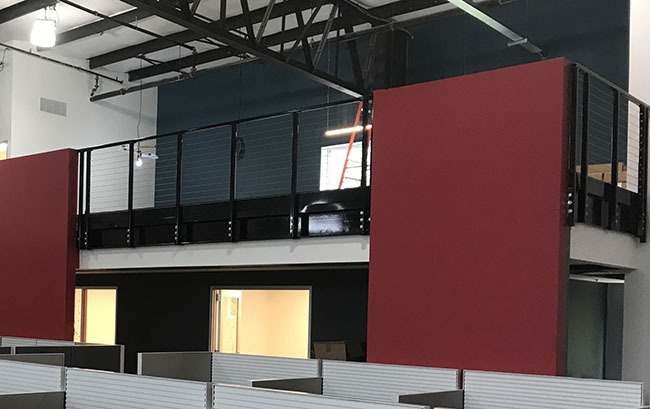 However, it is important to note that in order to fully install our mezzanine systems, the mezzanines must be anchored to the floor of the building, typically into concrete. Because of this, many shows and conference halls will have an additional charge for re-filling the holes in the concrete after the mezzanine has been uninstalled from the booth. Additionally, it is important to understand the limitations of the building and what regulations they require for these mezzanine/deck systems. First off, not all conference halls are going to be the same size in terms of the rooms that they will be in, the size of the booths available, and the ceiling height of the rooms. 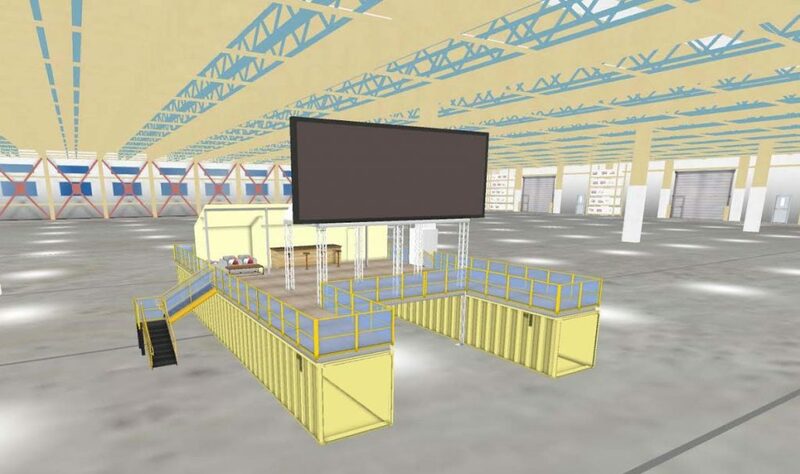 When designing a trade show mezzanine, it is going to be important to take each of these aspects into account as well. Some buildings have different requirements for clear heights. If you are planning on reusing the mezzanine again in the future, it might be best to have this in mind during the initial design. Your safest bet would likely be to go ahead and design it to the most strict standards, even if they are not required at your up-coming show. This will include more than just deck height, however. Since the mezzanine will likely be traveling across the US, state to state, meaning it will need to meet codes wherever it could be installed. And since this going to get high amounts of public foot traffic, it will likely need to meet some of the strictest forms of IBC code. This may include railing with pickets or wire mesh included to keep people from falling. Additionally, areas that are prone to a high number of earthquakes (California) will need to pass their local earthquake codes. However, do not fear. Panel Built, Inc. has years of experience designing and engineering these systems to meet these exact sets of codes! Overall, trade show mezzanine can be a piece to design your next trade show exhibit around. With all the extra space that the second floor provides, you will not only open up your company’s exhibit, but can also save you money in the long run, reducing the total amount of floor space that you have to purchase at each show. The second floors make a fantastic lounge-like area where you and potential clients can discuss your businesses 1 on 1. If you are interested in using one of our mezzanine systems as a trade show mezzanine, give us a call at 800.636.3873, send us an email to info@panelbuilt.com or talk to us through our LiveChat in the bottom right of your screen. We are happy to answer any questions you may have.